MACH Acoustics Blog: Deconstructing Construction Detailing - easier to use than to say! Deconstructing Construction Detailing - easier to use than to say! 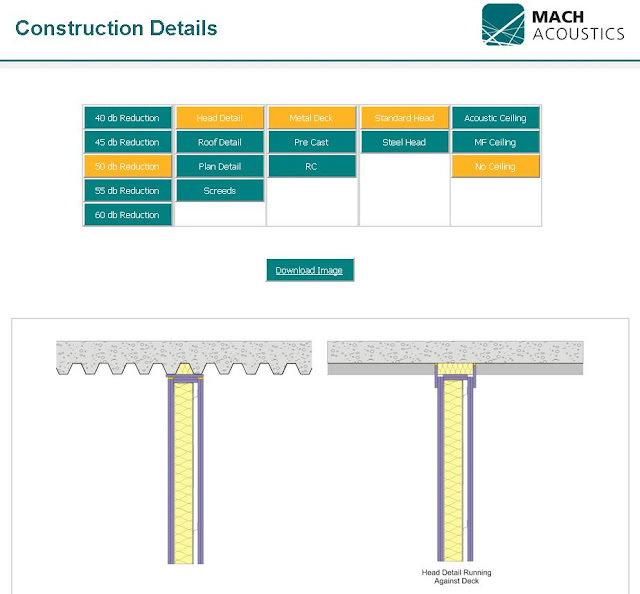 The MACH Acoustics construction detail finder is an innovative new free online tool that allows the design team to instantly obtain suitable lightweight construction details. The simple to use navigation system allows the user to first select the approximate level of sound reduction they require, and then the type of detail needed (head/roof, plan and foot/screed). The user then indicates a frame, soffit and/or ceiling type (when applicable) to find a specific detail. The image can be downloaded, and the process repeated, quickly building up a selection of details in a matter of minutes. The construction details of floors, walls and junctions in a building are critical to its acoustic performance. It is important to consider that sound not only transmits direct through a wall, but also through flanking paths around the partition through adjacent walls, floors, ceilings, junctions and penetrations. Inattention to these details can seriously degrade the level of sound insulation from room to room, leading to unexpected poor performance in pre-completion testing, occupant complaints and the requiring of remedial work. On the other correct detailing can ensure a level of performance equivalent or better than design targets, giving an excellent acoustic environment. In some cases this will even lead to cost savings by value engineering of wall and floor types, in the knowledge that the risk of flanking sound transmission has been minimised. This tool is in development and we are open to all comments and suggestions to help improve the way that we work with our clients.